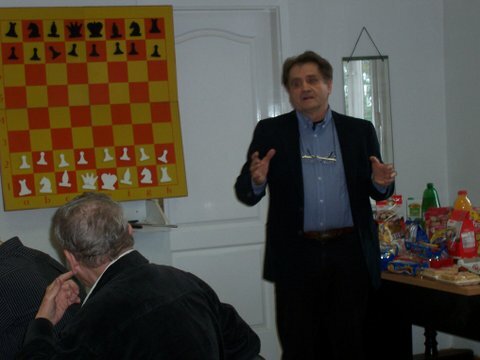 RAC Club had a blitz tournament and lecture by FM Mihok,L to close out the season. There was a massive snack table and we had three massive pizzas too. Ashley Tapp(CAN) dropped by with her brother Jacob and mum Sophia as club guests. Ashley is living and training in Budapest to up her game. She has just played in the Art Pub FIDE Open and the Budapest Spring Festival tournaments and will play in as many Hungarian tournaments as possible for valuable experience. 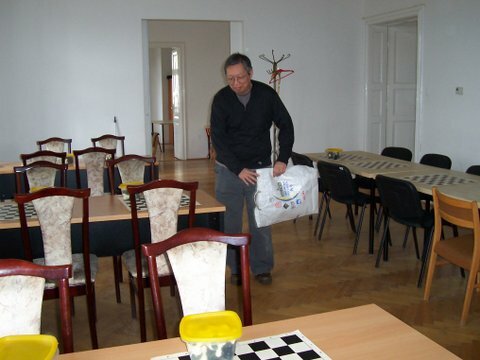 See the Hungarian Chess Federation Tournament Listing for other (really cheap!) tournaments. 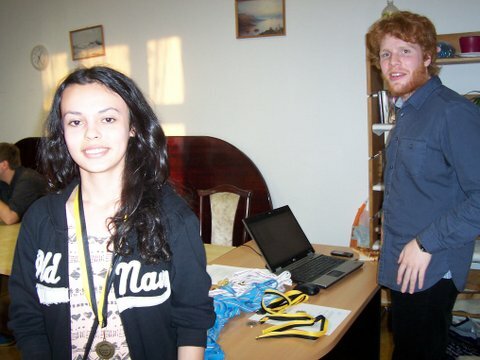 Special guest Tapp,Ashley(TheChessGirl) with a medal from the blitz tournament. Here is some chess passion from Budapest artist(and chessplayer) Mihajlova,Diana. For the complete article see Chess is Art!! ‘The fifteen paintings on the theme of chess, which are the subject of this article, were created over a three-year period intercepted with long breaks of playing chess, writing about chess, organising tournaments, travelling and daydreaming. By now, they are disconcertingly longing for prospective tender owners. More Budapest chess coming soon! Here is the start list so far. The Lila Futo series of open tournaments is run as a Grand Prix. 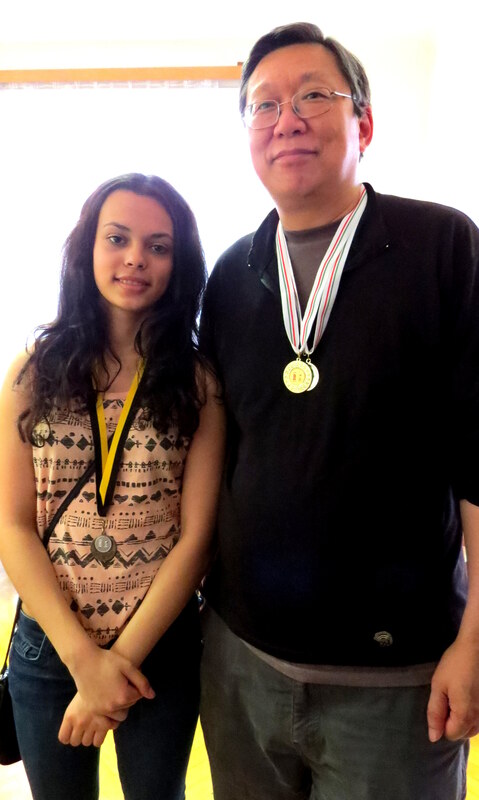 I played pretty bad but at least I made another chess friend, Dorina(Thanks to the parents for taking the pic). We had a couple of practice games(she got 1.5/2) before one of the rounds where I managed to miss a couple of little tactics. I went on to miss quite a few more tactics during the tournament. IMs Szalanczy, Emil and To, Nhat Minh shared first with 6/7. I had a great time but had an awful performance with 3.5/7. A big well done for the organizers who ran a smooth tournament and managed also to produce PGNs for all the games in the tournament. I spent the day trying to forget my horrible play but soon the games must be examined as I try to figure out what went wrong…. One exiting moment came in my game against Katona,G. I tried an Alekhine’s Defence and fumbled my way through the game, reaching the following position after 44.Qxb7(diagram). White had been trying to kill me but lost his way in the opposite colored bishops attack. I found 44..Qg3! for the winning attack and mate could not be stopped. White tried some checks 45.Rh7+ Kg5 46.Qd5+(diagram) I was quite short of time and not 100% sure who was going to mate who. Now I interposed with 46..Rf5! and held my breath. White continued the checks with 47.Qd8+ Kf4 48.Qd6+ Re5(diagram) My king marched up the board but I still could not see the end of the checks. The Black king has become an attacker and is completely safe in White’s half of the board. I played the next move quickly. White has no way to resist as mate is coming soon, so 0-1. The hard working organizing team-Well done! IM Szalanczy, Emil leads with a perfect score 5/5. I struggled to win in rd5 with black and have 2.5/5 and am having a generally awful tournament after failing to win my won game in rd4. I started with a modest draw as Black. Thanks to the organizers for the gallery. PGNs will be done a bit later I assume. Starts today! Sixty-nine players so far. 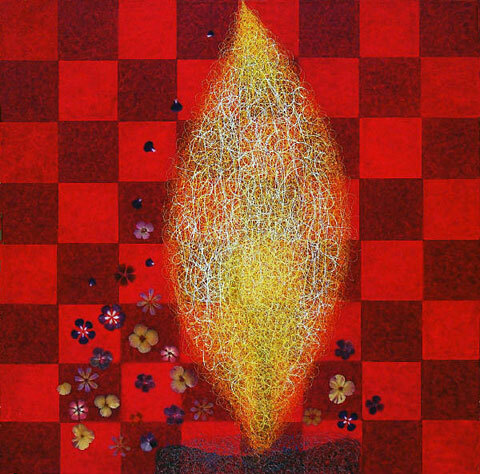 More from GeniuszSakk. More tournament info from Chess.hu. Időbeosztás: 2 x 90 perc valamint lépésenként 30 mp. Berta Sandor was first on tiebreaks with 6.5/9. My RAC teammates Julianna(6.5) and Zsuzsanna(6) Terbe finished in =1st and second for an excellent result. Both are coached by FM Radnai,Adam, also my club mate. Well done! Hungarian player entry fee for FM groups at First Saturday is 12,000HUF(39RUR). Foreign players see pricing information from First Saturday FM-A Entry Fee Schedule. Note there are no prizes in any FS FM groups. 66 players so far. Looking forward to another great tournament. Yikes!! Two Canadian players in the same tournament….The Canadian invasion begins.